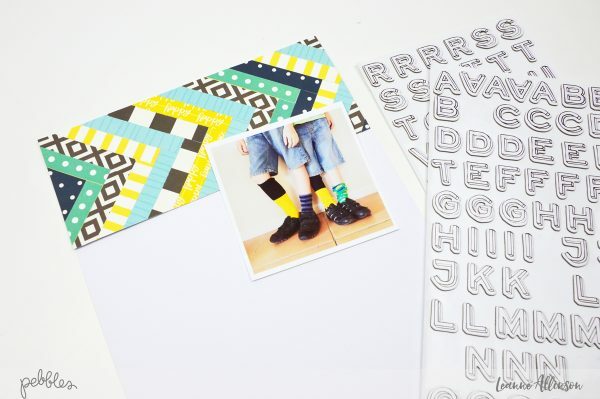 Create your own unique tribal patterned paper detail on your next layout! - Pebbles, Inc. 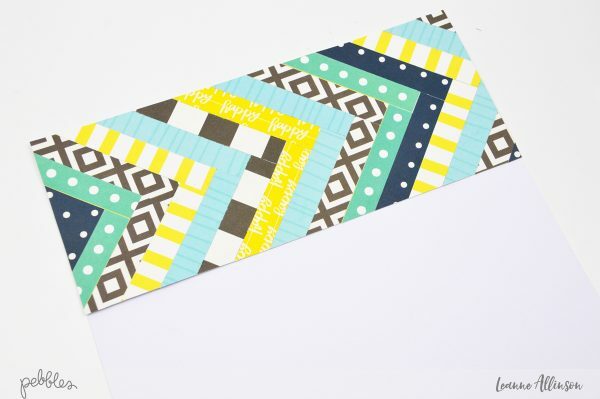 Create your own unique tribal patterned paper detail on your next layout! Hello Pebbles Friends! 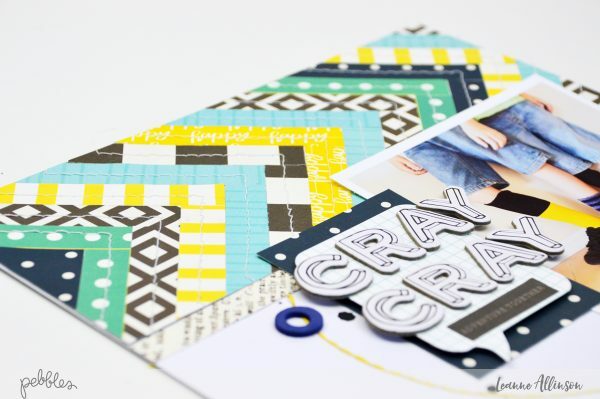 Today I am going to share a fun technique involving patterned paper strips to create your own unique look on your next page. Placed in a repetitive pattern, these paper strips can replicate a tribal style pattern, that will colour match the photo/s you want to scrap. A general goal for me when creating a layout, is to subtly link as many elements together without causing confusion to the viewer’s eye. This tribal pattern suited the story I was documenting about crazy socks and why my boys wore them like this! 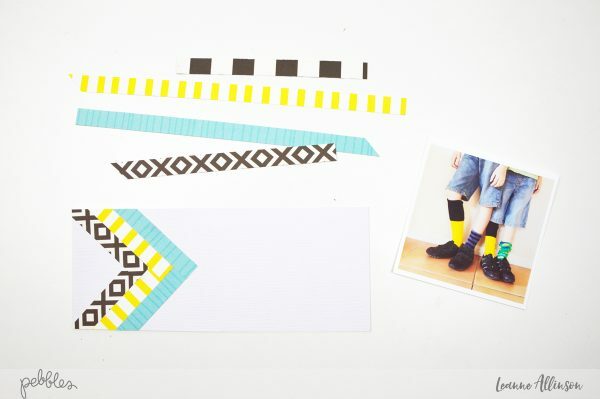 To recreate this look, start by trimming several strips of colour matching patterned paper. I also stayed true to the tribal idea, by using bold geometric shapes and simple stripes. step 1. 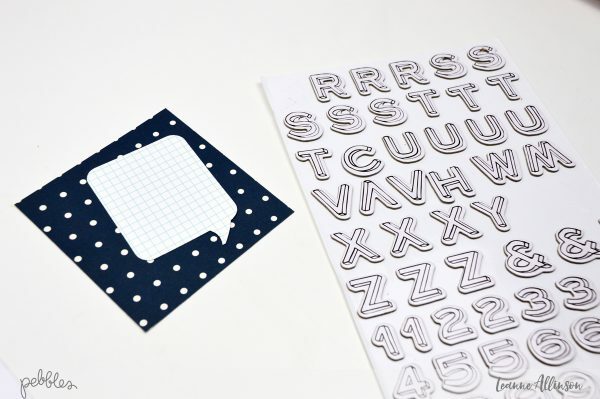 Use an off-cut piece of cardstock the same width as your layout. Trim strips of patterned paper to 0.5″ wide. step 2. Roughly find the center of the cardstock length and align the first patterned paper strip towards it, starting from the top corner. See black and white paper strip above. step 3. 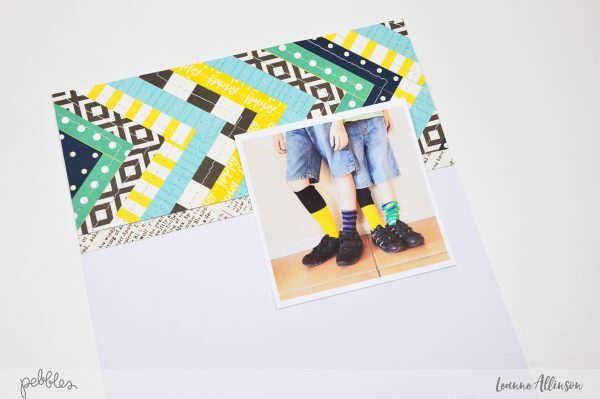 Align the second matching paper strip to meet in the middle of the cardstock, joining the outer edges of the patterned paper at a right angle. 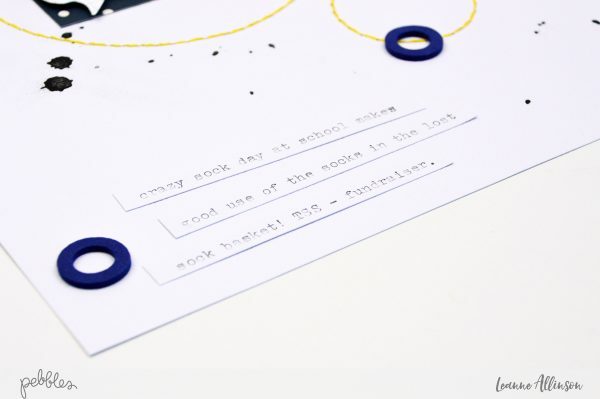 Adhere the paper strips to the cardstock and trim the excess, using the cardstock as your guide. step 4. 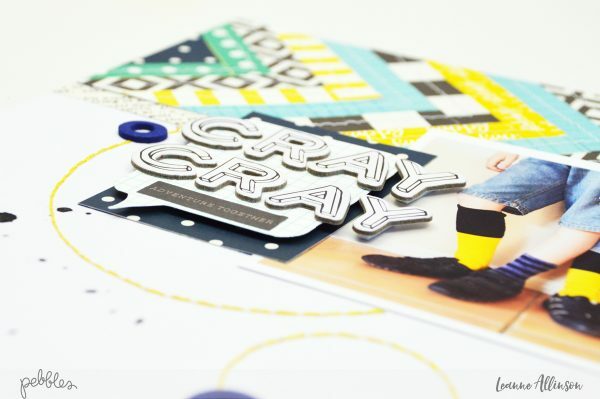 Continue to add paper strips to the cardstock until it is completely covered. step 5. 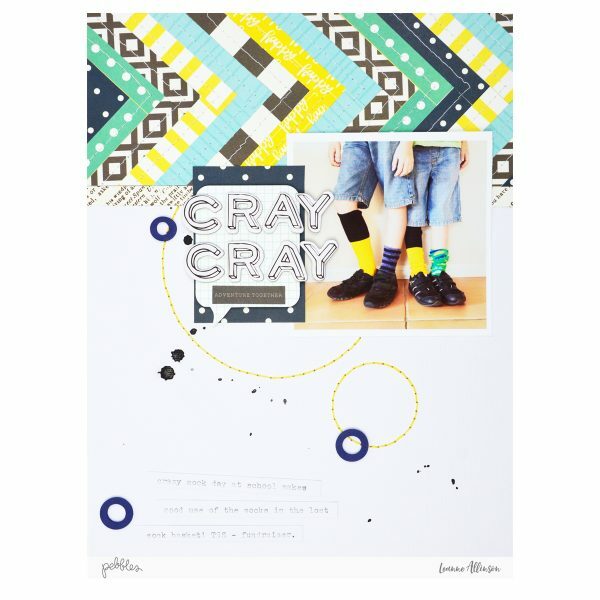 Adhere the tribal patterned paper and cardstock to the top of your layout base. step 6. Machine stitch along each of the angles for a more textured feel on the layout. I have used a white cotton thread to link back to my white cardstock background. step 7. 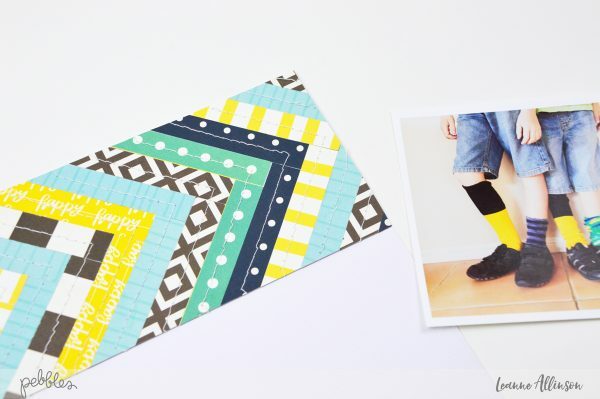 To ground the multitudes of colour and patterns in the tribal piece, add a border strip between it and the cardstock base. This paper strip also measures 0.5″ wide. Because I want to highlight the use of patterns on this page, the title on this layout needs to be unique in its own right. The lower half of this layout has been limited with both colour and design elements. The patterned papers and thickers have fine lines and could almost be considered invisible after the use of such bright, bold colours at the top of the layout. To link the tribal patterned paper piece, photo and white cardstock, the title now becomes quite dynamic. The speech bubble has rounded corners to balance the sharp angles from the paper strips above. To prevent this element from becoming lost, select a paper used in the tribal paper strips to layer underneath. Add the thickers to the speech bubble and use foam tape to lift it from the layer of paper beneath. 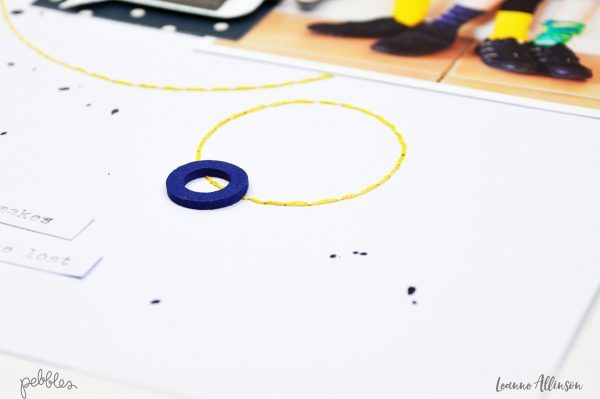 To further off-set the sharp angles at the top of the layout, hand stitched circles are used in various sizes. The navy foam ‘o’ thickers are also used for texture and dimension. 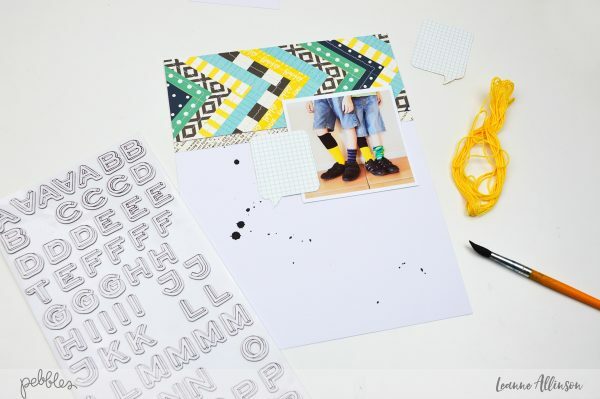 Complete the layout with journaling strips and a few light splashes of black paint. This technique is actually not as complex as it initially seems. 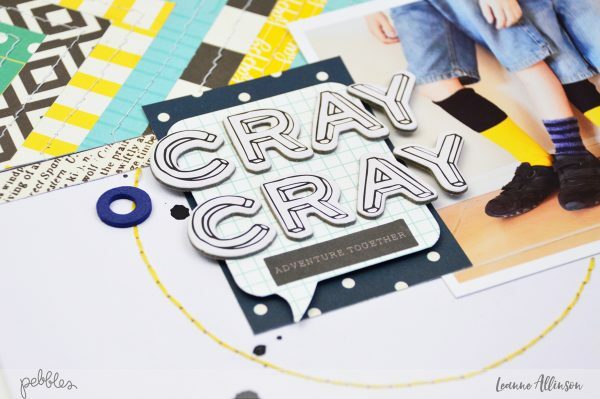 With a little time and enthusiasm, I bet this idea won’t seem as cray-cray to you as once before! Happy Lost Sock Awareness Day!